I have a recent thing for antique quilts. This was inspired by a quilt I saw in a magazine (Country Home?). It was solid red and tan, super simple, but made such a big impact in the room. So here’s my take on it, with some really fun red fabrics. And now I have a fabric stash totally void of anything red. Luckily there’s an easily solution for that. This quilt top is going to lay at the foot of my bed, and once again reminds me that simple is (almost) always better. And even better if its red. This quilt top measures 61” by 83”. If you’d like to make it yourself here’s a quick tutorial. 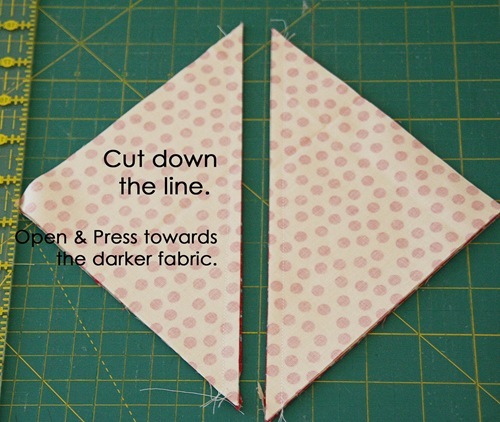 Chain piecing comes in handy here and they whip up really fast. Now do this 83 more times. Sounds like fun doesn’t it? Stack 2 or 3 at a time for cutting to make it go faster. My quilt was 11 squares by 15 squares. If you want it to fit a twin sized bed, I would account for some shrinkage and add one more column, making it 12 squares by 15 squares, or 67” by 83”. The tan fabric I used is from Joann’s. If I remember right it was country classics in ivory? Double check that because I’m not positive, it was the same color as the linen. 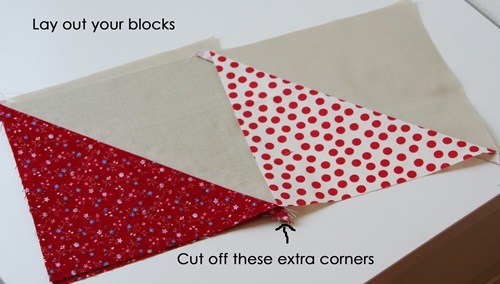 I LOVE your quilt AND the tutorial. I’m a beginner, so it really helps. Unfortunately, I’ve tried to print your directions six times and instead of your tutorial, I get pages and pages of Craftsy ads. This has never happened to me before, and I’ve printed many tutorials. Any suggestions? Try to copy and paste only that which you wish to print. Copy to a Word document, and you can copy the images to your document so you see what the quilt should look like. If I had to buy the fabric. how many yards total for each color? Absolutely beautiful! I love the simplicity of the look of it. I can't believe how much sewing you manage to accomplish!!! LOVE this! Guess I needed that 101st tutorial…I finally understand! This quilt is lovely! Great color combo – very inspiring! I have to try this one! thanks for sharing! Love it! And you're right…simple is good and if it's red, all the better. Thanks for sharing! How Striking! What did you use for your tan fabric? Love it! Your red quilt is absolutely gorgeous. Thanks for sharing the quilt and tutorial. Oh I love it! Triangle quilts are such a favorite, and this color combination is really beautiful. Well done! I just recently found your blog and have loved looking through your quilts. They are amazing. Each time I see a new one I say to myself "ooh, that will be my next quilt project…" This time is no different. I LOVE THIS QUILT! Not only do I love red but it looks simple enough that I actually could make it. Anyways, just wanted you to know I love your blog and your quilts! The red and the linen are such a fantastic combo! You are so generous with your tutorials. Thank you!! i do love your quilt! it's wonderful with all the variety of red prints. Love it! Can't believe what you young moms accomplish…way to go! I would have never thought to use tan and red together…it looks amazing! I love the simplicity, and the red just pops! I love half square triangles almost as much as I love circles. Just a tiny note on your tutorial. I find that if you want a 6 inch finished block it is better to start with 6 and 7/8 cut blocks. Once sewn and pressed you get a 6.5 inch unfinished block. Otherwise I make them exactly as you do. Amazing quilt! Simple is indeed best! *sigh* So much beautiful theory… which never quite translates to reality for me. I'll just enjoy *your* straight seams and matching corners :) I love that sweet red print with blue and white flowers from Joanns, btw. I have used it many times. 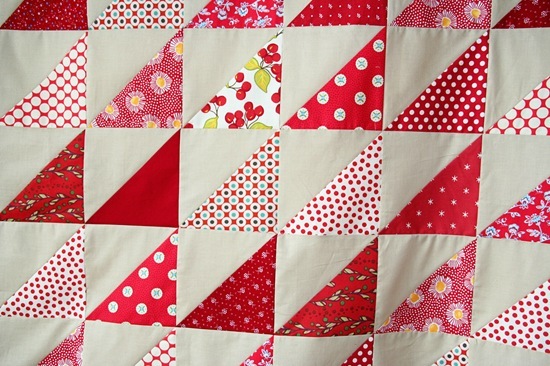 I really like this quilt, all those red triangles are very striking! I would usually think to pair the red triangles with white, but I will have to rethink that because the linen really works. Okay, maybe is 101 triangle tutorial, but this is the first one I actually understood! I've been so afraid to try anything but squares and rectangles, but will be tackling triangles today. Thank you!!! I have this huge pile of 6.5" blocks from a previous Snowball quilt which I am not sure what to do with. Now I know…I am going to make this quilt. Thanks! The tan fabric I used is from Joann's. If I remember right it was country classics in ivory? Double check that because I'm not positive, it was the same color as the linen. Oh I'm so glad you shared that last tid-bit of information b/c I've been seeing awesome quilts like yours all over blogland and wondering where on earth to find that color fabric to use with the bright and bold prints and colors that everyone is making!!! Wow!Oh I`m so glad to found this great Tuturial. Thank you so much! I never would have figured that out, now I can't wait to try it! Thank you so much for your tutorial. A friend of mine sent me the link to your wonderful website and this quilt because she thought this would be a good first quilt for me to make. I want to use the fabric from my daughter's wedding and I was wondering how many different fabrics do you think I would need? As I was cutting up the fabric that I have I realized that, even though there is a bunch of fabric, there are only seven different designs. How many would you recommend? Will I be repeating too many if I only use these seven? Thanks so much for your help. that is such an awesome trick! Hi, I love your blog, so clean & fresh, just like your quilts, lots of energy.. I will come back.. check out my blog to see the quilts and papercrafting that I do. . I just found your blog and LOVE it. I made the same quilt, only in blues. Well, it looks like I am late to the party, but I really enjoy the blog and the tutorials. Thanks so much, I will be returning again and again. Hi! I love this pattern and colour scheme!! 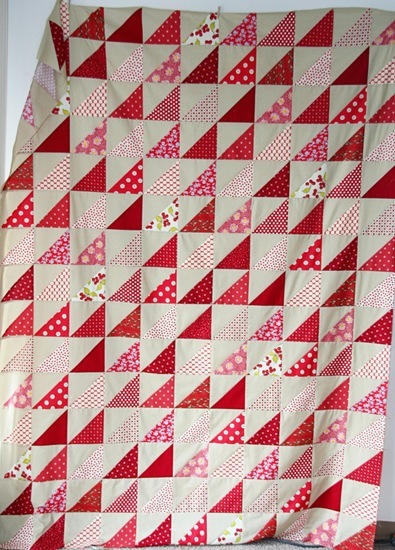 I have found two red and white patterned fabrics that I want to combine with plain white fabric and maybe another red patterned fabric but can you advise how much plain fabric and how much patterned fabric you used for this project please?? I love the variety of reds you used. This is definitely a wonderful quilt! 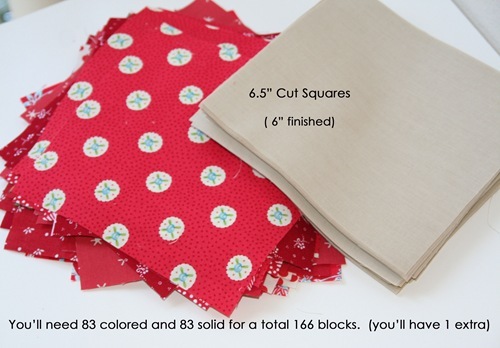 Do you mind sharing how much of the plain fabric you needed to make 83 squares? I have cut my patterned squares out and am ready to purchase the solid. I am making mine for my baby boy, due in September. Thanks! I love this darling quilt. I am confortable in making HSTs but when stitching everything together in rows, pressing seams in the proper direction so seams wil nest ihas always been a problem. I don’t care for oopen seams except for exceptional circumstances. 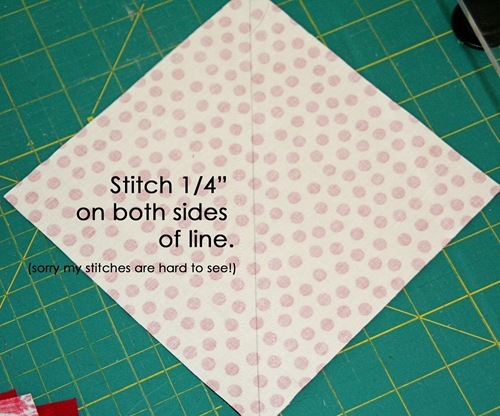 Long story short: how did you press your straigh seams? It seems to me that some will have to be pressed to the light. 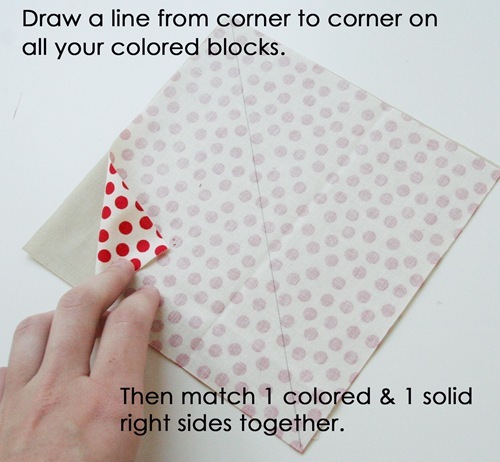 The red and tan quilt is lovely, so much that I’d like to make one for a friend – but in gray and red. How much background fabric will I have to purchase? I have trouble printing your patterns too!! !